Bollywood stars have proved that their earning is not less than Hollywood stars. 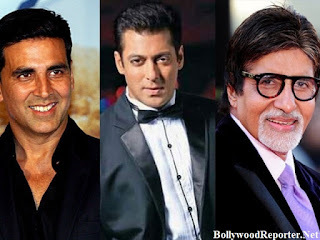 Amitabh Bacchan, Salman Khan and Akshay Kumar are among the World's top ten highest-paid actors in Forbes first global list of actors from Hollywood to Hong Kong and Bollywood. Amitabh Bacchan and Salman are at the same place in the list, both are at 7th place with estimated earnings of $33.5 million in the past year. Akshay Kumar follows behind in ninth place with $32.5 million. Name of Shahrukh Khan (18) and Ranbir (30) with estimated earnings of $26 million and $15 million respectively, also included in the list. Amitabh Bacchan starred in more than 150 movies in his career of 50 years and still he earns top money for his roles in flicks like Bhoothnath Returns in 2014. One of India's Biggest star Salman Khan has appeared in more than 80 movies since 1989 breakout from Maine Pyar Kiya's role. Khiladi Bhayya has been appeared in some 150 movies since 1992's Khiladi. SRK was described as "India's Leonardo DiCaprio". He earns from movies such as Happy New Year and Fan, as well as lucrative endorsements including Pan Masala. And Ranbir is one of youngest actor from Bollywood to join the World's Highest-Paid Actors list for the first time in the industry. Ranbir banks a decent pay from movies like Roy and Bombay Velvet. The Iron Man(Robert Downey Jr) topped the list by earning $80 million and the second position is held by Jackie Chan by earning $50 million. Others among the top ten were Vin Diesel (3), Bradley Cooper (4), Adam Sandler (5), Tom Cruise (6), and Mark Wahlberg (10). A separate list of highest-paid actresses will be published later this year.